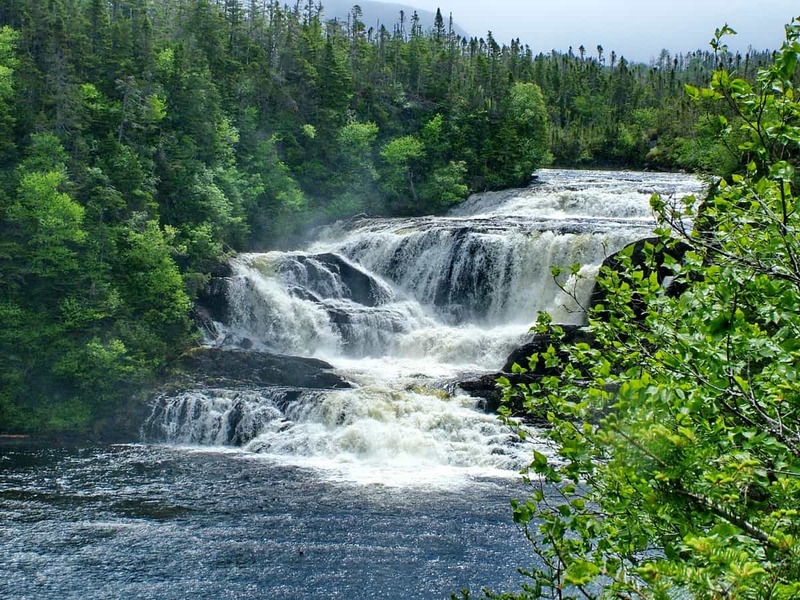 Baker’s Brook Falls is situated in Gros Morne National Park in the Canadian province of Newfoundland and Labrador. 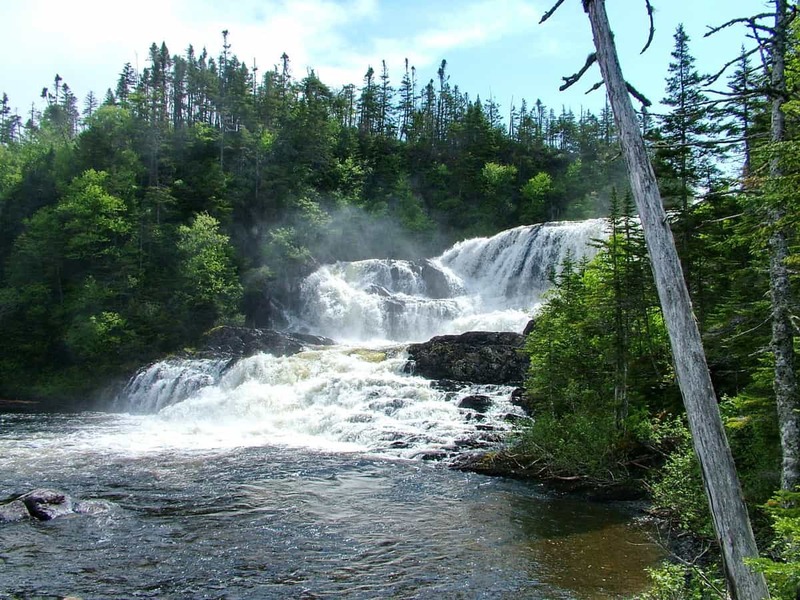 It is actually a series of three waterfalls that tumble over three successive limestone ridges underlying Baker’s Brook. 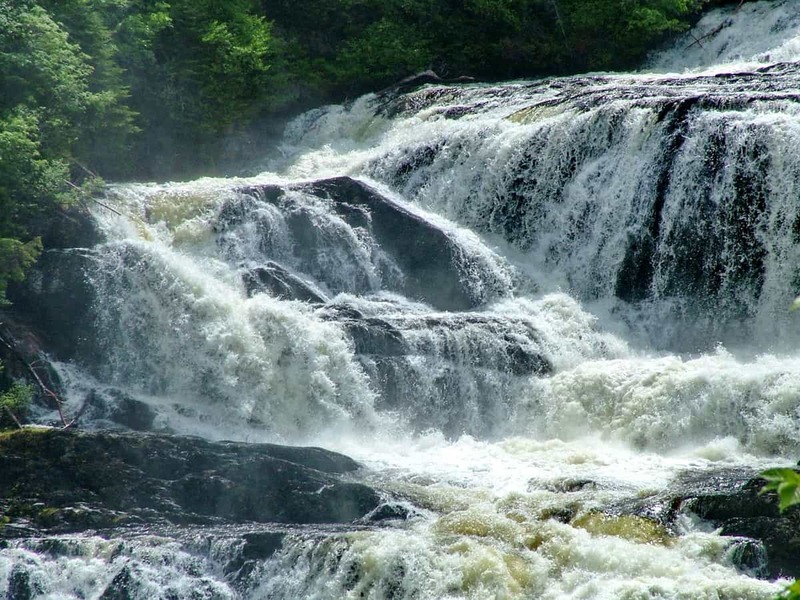 The middle set of cascades, seen here, are the most impressive. 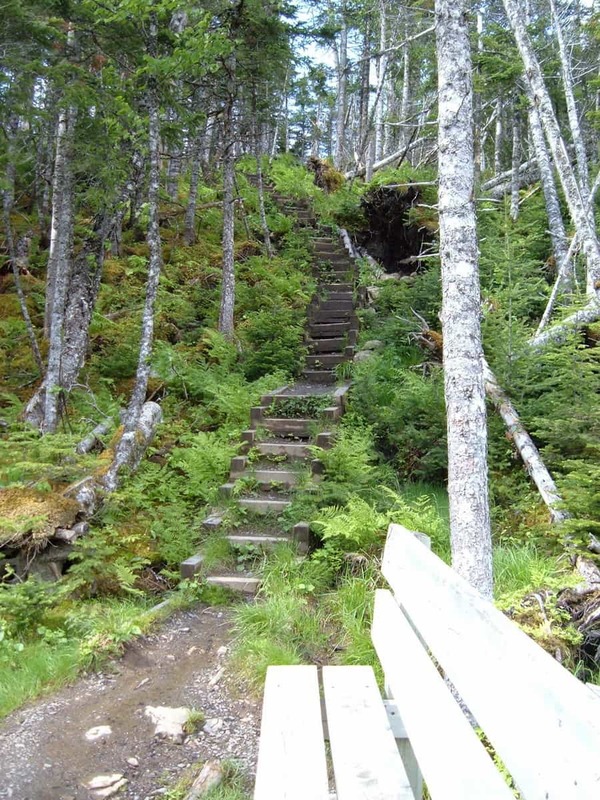 The trailhead for Baker’s Brook Falls hiking trail is located a few kilometres north of Rocky Harbour; the parking lot is situated in Berry Hill Campground. 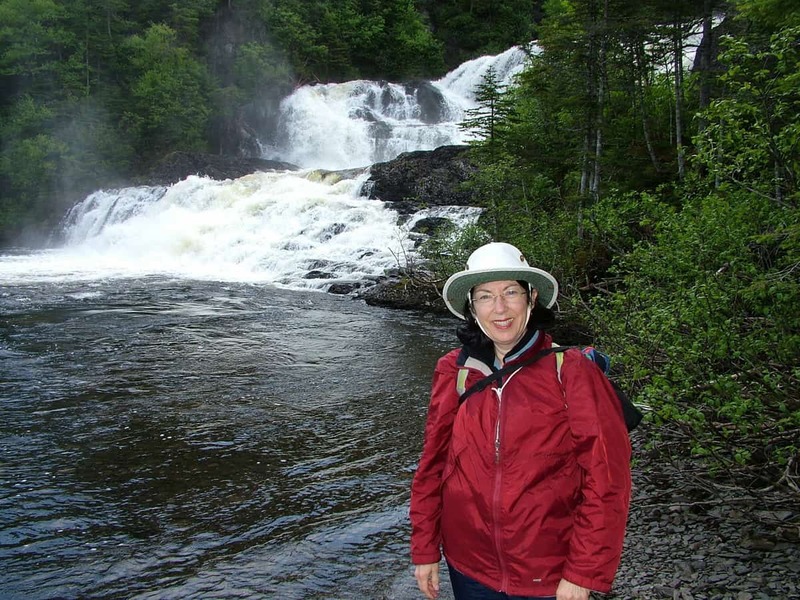 Baker’s Brook Falls is within easy walking distance and makes a lovely destination for a hike. 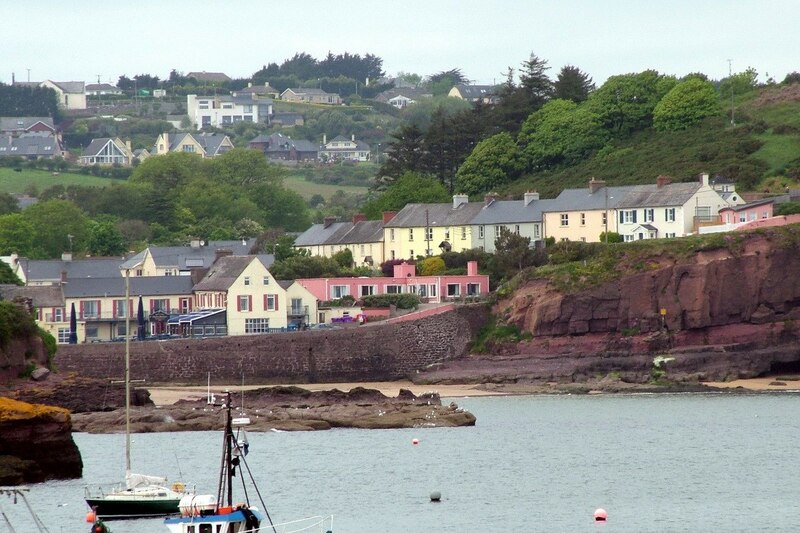 At 9:15 a.m., under grey skies and being subjected to fierce winds, we were ready to tackle the 9.5 kilometre trail. 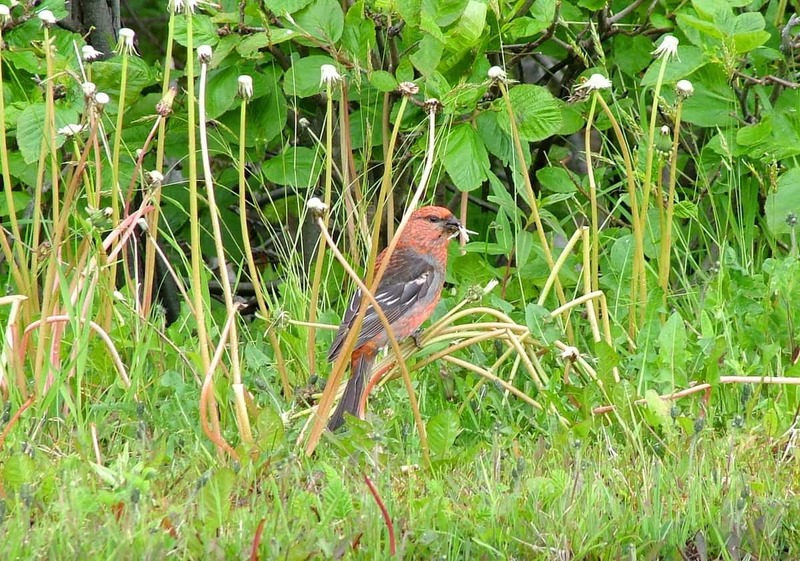 A flash of red detained us because we realized that a Pine Grosbeak was gathering dandelion seeds nearby. 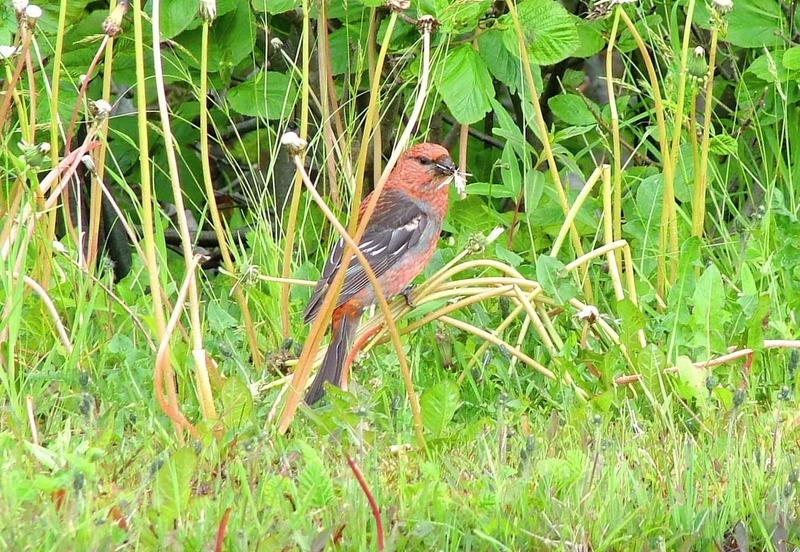 This handsome male finch can handily crush seeds with its stout beak and even nip off buds, fruit and needles from conifers and other trees. It would soon be breeding in that area’s open coniferous forests. Black Spruce and Balsam Fir stands grow thickly along some sections of the Baker’s Brook Falls hiking trail so we were afforded some shelter from the brutal winds. 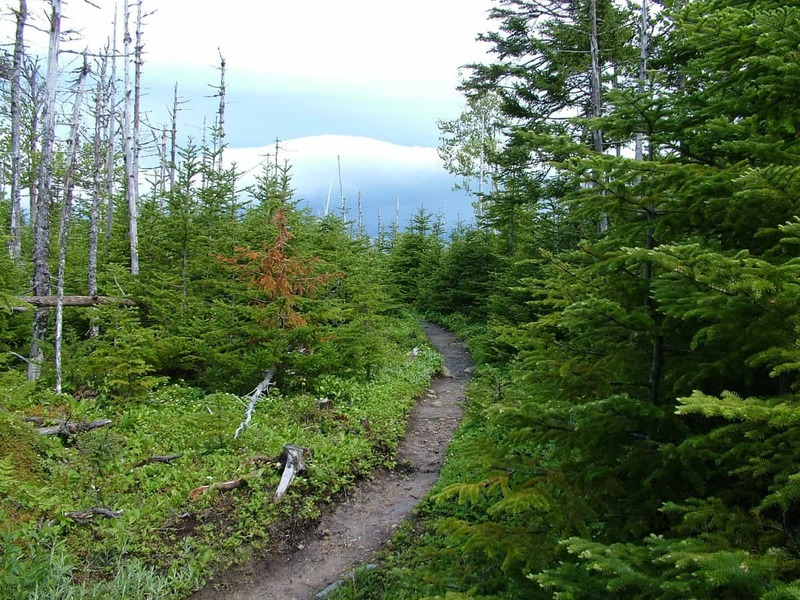 It was easy to see that the forest was at different stages of regeneration having suffered the effects of damaging winds and occasional insect infestations. Many fallen trees lay at the side of the trail. 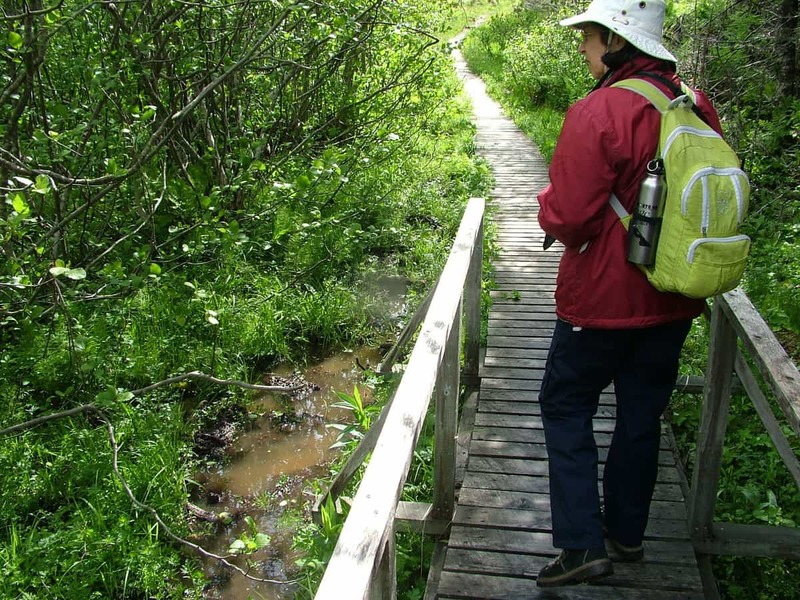 Extensive boardwalks assist hikers through the wettest sections of the trail but also serve to protect the flora. 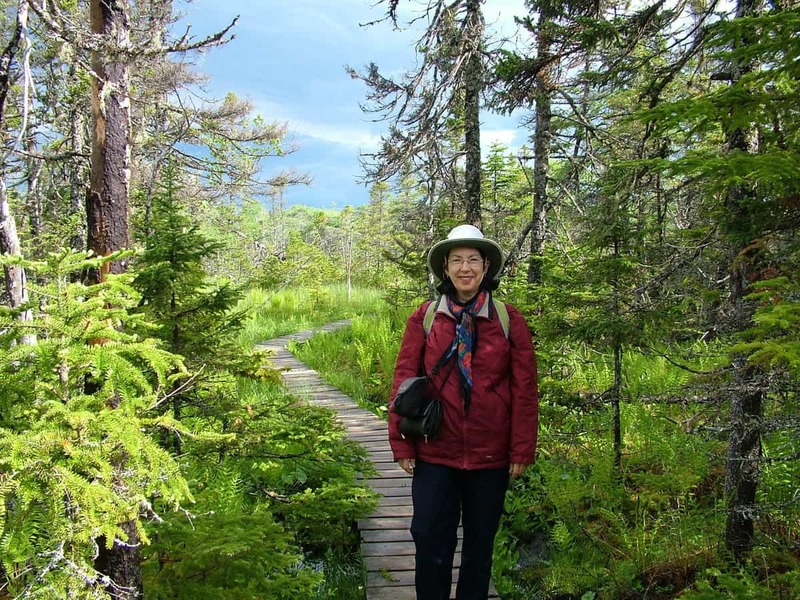 Thrilling Bob and me was the number of Purple Pitcher Plants thriving in the soggy peat along the trail. 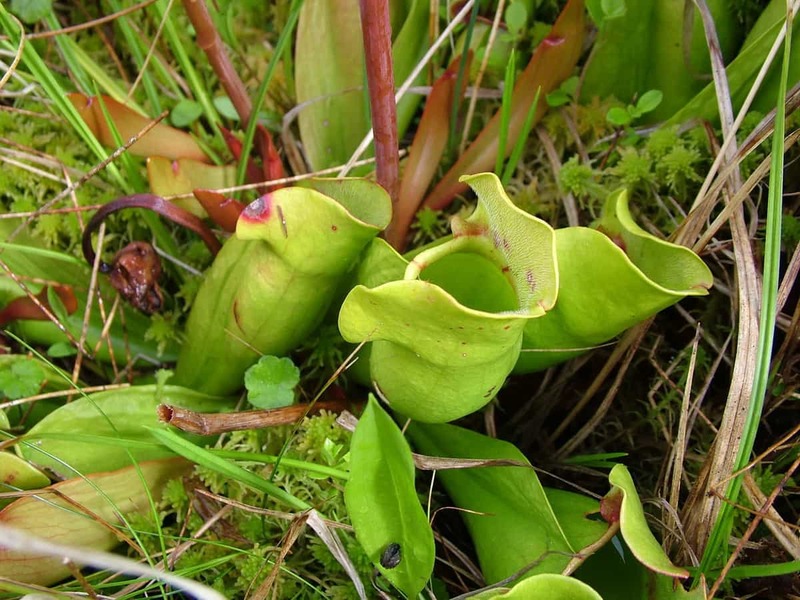 Pitcher Plants are carnivorous plants with uniquely shaped leaves that create a pitfall trap for insects and small creatures. 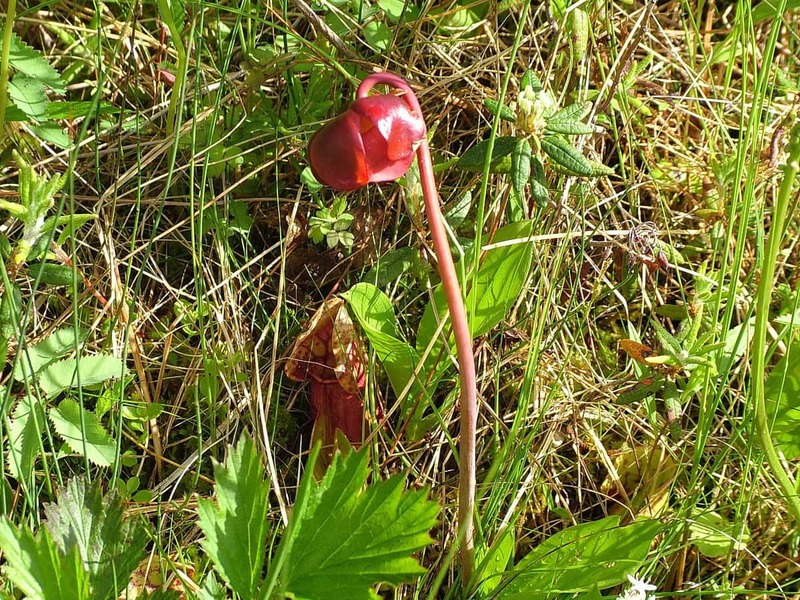 When damp, the leaves of the Purple Pitcher Plant are slippery. Insects attracted by the smell of sweet nectar easily fall into the cavity at the bottom of a leaf where they then drown in an accumulation of rainwater mixed with sugars and digestive enzymes. This solution, together with bacteria, soon dissolves the insects so the plant can absorb the nutrients. These perennial herbs are therefore well suited to live in boggy, marshy habitats that are low in nutrients. 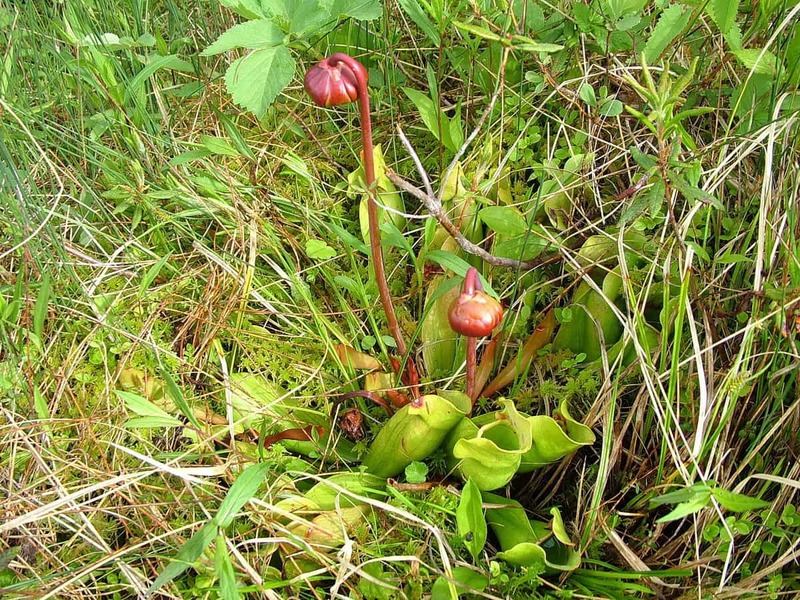 The striking wine and green flowers of Purple Pitcher Plants first caught the attention of Queen Victoria some 100 years ago, and led to the plants being selected as the provincial flower of Newfoundland and Labrador in 1954. Also along the boardwalk, Bob and I saw evidence of Moose in the area. 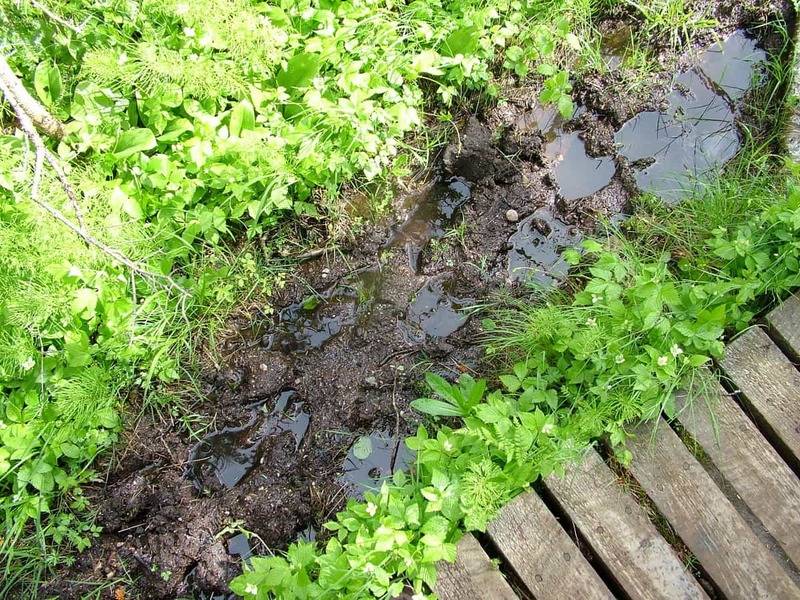 Their tracks had left a muddy trail through the bog, piles of droppings littered the walkway, and we could see where they had been browsing on twigs in the woods. At one point, I turned swiftly to look at a bird, and instead, I spotted a young cow Moose standing among the stunted Balsam Trees. The wind continued to blow fiercely, and as we progressed through the bog, there were several occasions when gusts nearly knocked me into the wet and muddy swale. 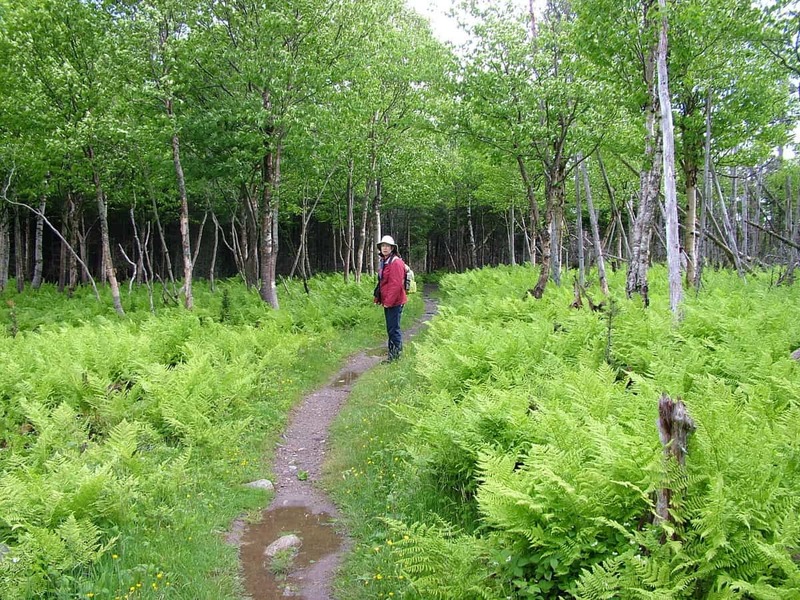 It was refreshing to enter into an open area carpeted with lush Ferns and a stand of deciduous trees topped with new green leaves. These would act as a windbreak. We were not alone there in the woods. 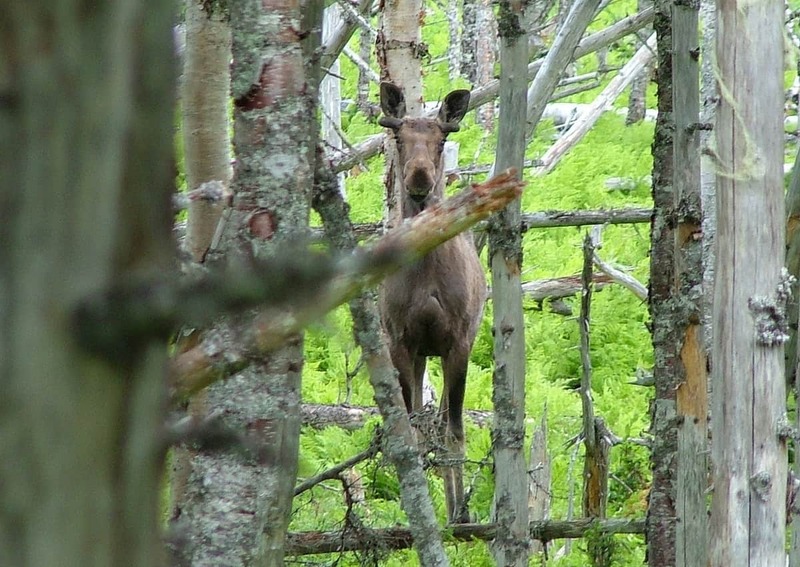 A young bull Moose was observing our every move from its camouflaged position among some grey tree trunks. Nearer Baker’s Brook Falls, distant mountains began to overshadow us. Valleys filled with snow gave proof of the cold temperatures that still endured even though it was late June. 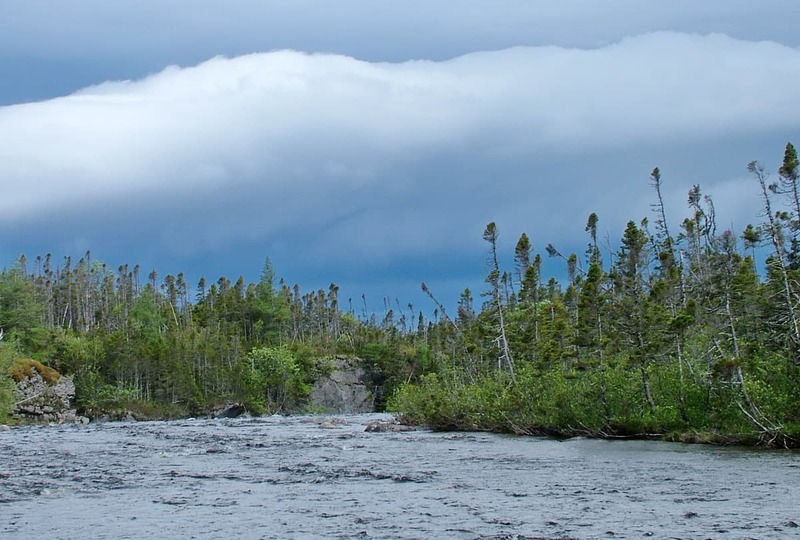 Bob and I could hear the flow of water in Baker’s Brook long before setting eyes on it. 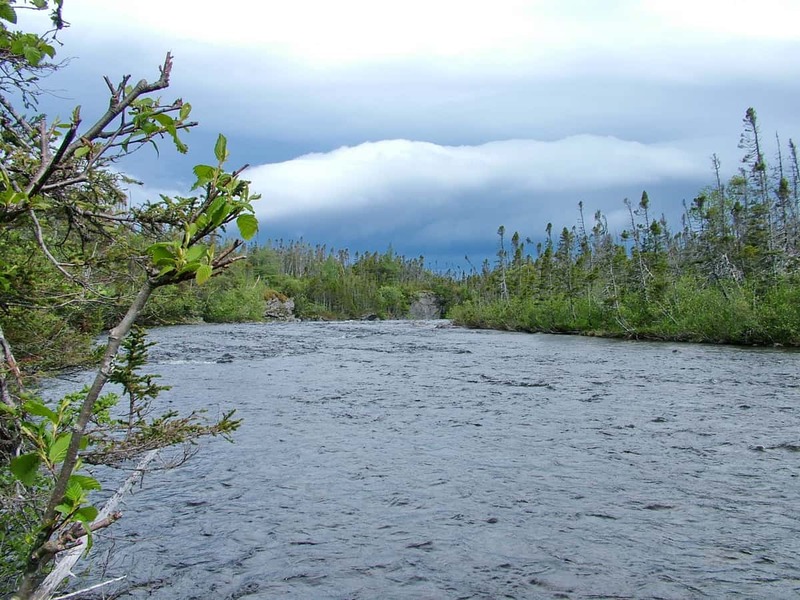 It is a vigorously flowing river whose source of water is a land-locked fjord called Baker’s Brook Pond. 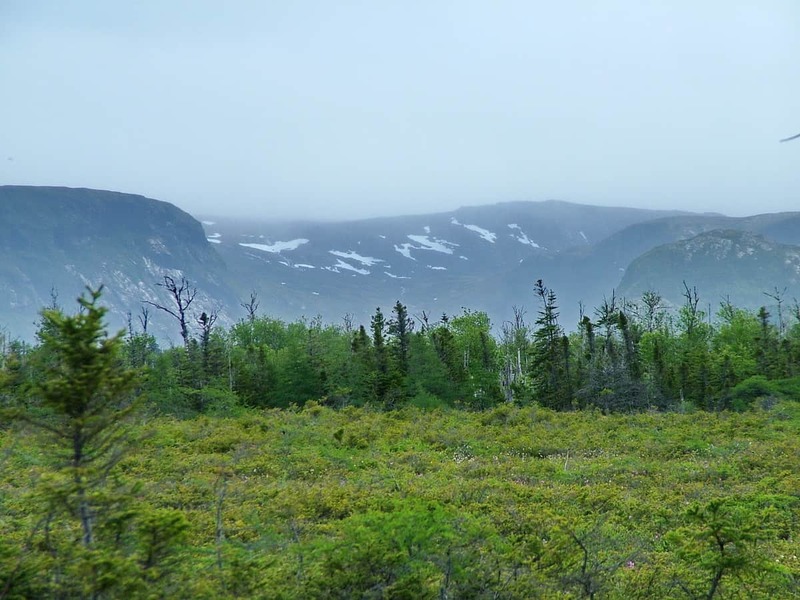 It is just north of Gros Morne Mountain. Looming skies in the near distance encouraged us to make haste. Our first view of the lower cascade at Baker’s Brook Falls was seen from a distance through an opening in the trees. Luckily, the sunshine persisted. 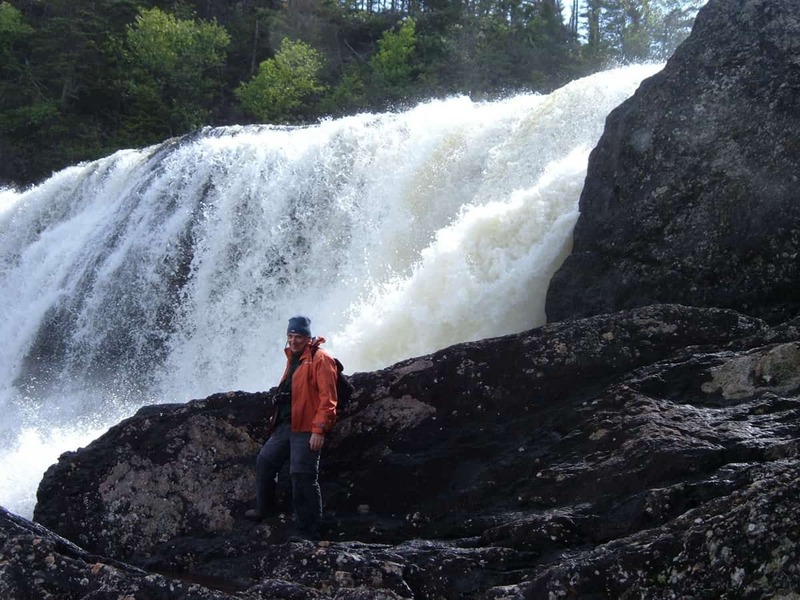 The Falls have an amazing volume of water raging over each precipice, which makes for a beautiful vista. 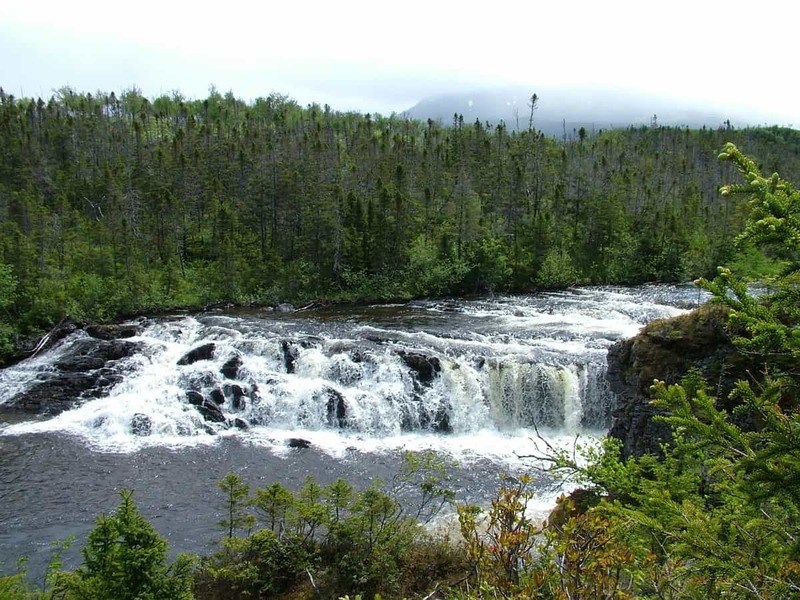 The hiking trail hugs the river, and a slight increase in elevation afforded an unexpected view of the middle cascade located above the first set of rapids. A rustic set of stairs set into a steep slope eased our passage up a high ridge that would bring us out nearer the middle cataract. 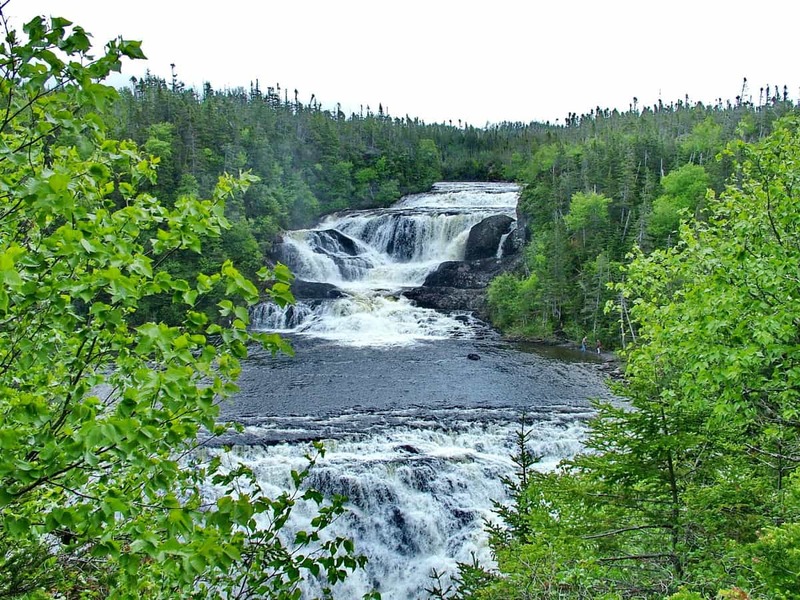 The precipice at the middle falls only represents a drop of 10 metres, but the intricacies of the channel create a 4-tiered array of gushing water that is very pleasing to the eye. Already dampened by intermittent sprinkles of rain, we figured that a closer look at the waterfalls couldn’t make us much wetter despite the rising mist emanating from the frothy turbulence. It was just us and the river. Everything else was blocked out by the deafening roar and dwarfed by the sheer power of nature. Moving in for a very close look at the plunge pool, Bob took extreme care and didn’t remain on these rocks for long. 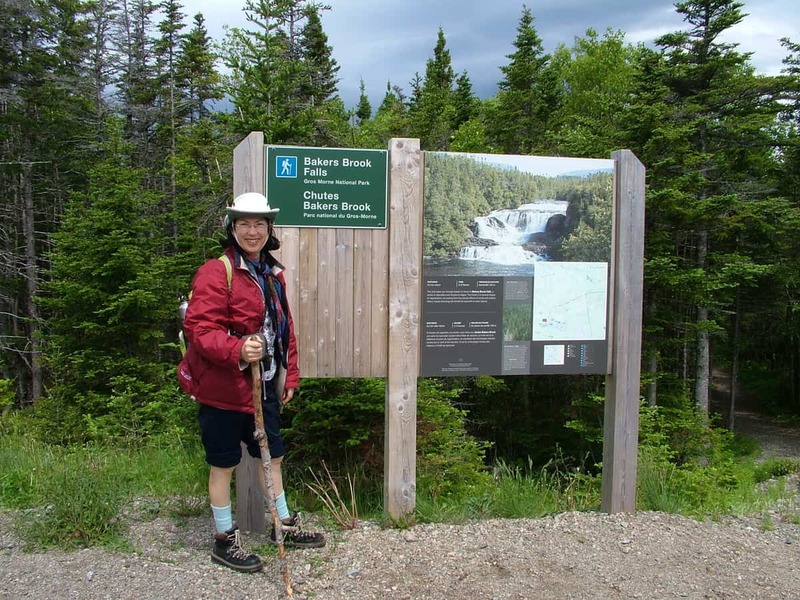 After climbing over slippery rocks and up steep slopes to get to Baker’s Brook Falls, we were glad to be back on one of the many wooden boardwalks. Still, little delights awaited us along the trail. 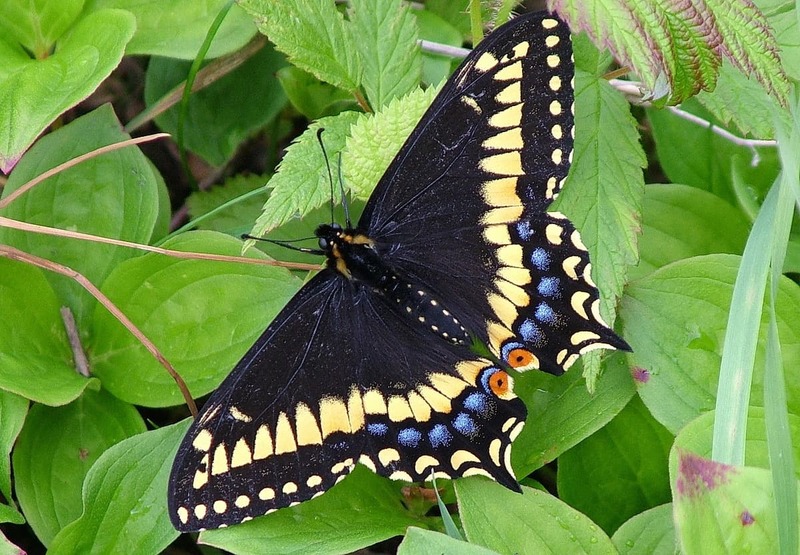 As butterflies are want to do, a Black Swallowtail Butterfly was puddling on the damp earth. It uses its proboscis to acquire minerals diluted in the droplets of water. 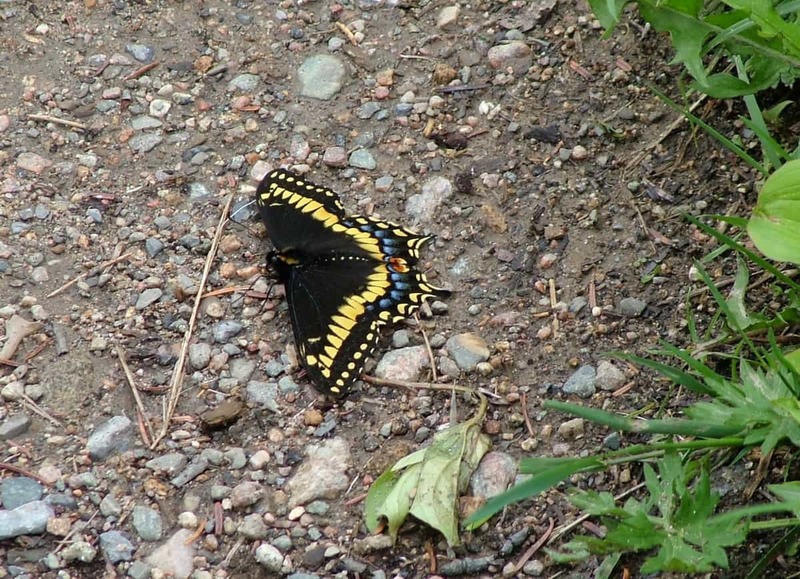 The Black Swallowtail Butterfly soon moved onto some vegetation next to the trail, perhaps hoping to dry its wings in the sunlight. Not sure how we missed seeing these pretty pink flowers on our way into the Falls, but the bright pink of the Rhododendron Canadense certainly stood out against the boughs of this Balsam Fir. 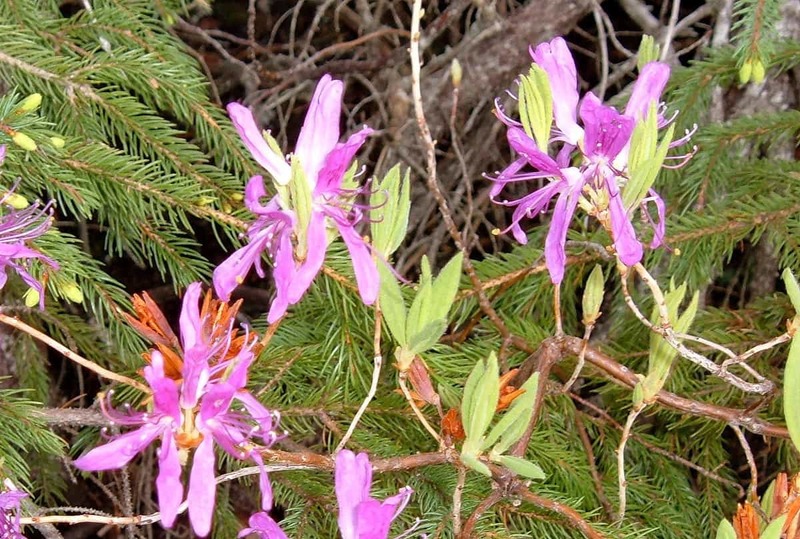 Rhododendron Canadense is a native flowering shrub of the azalea family. 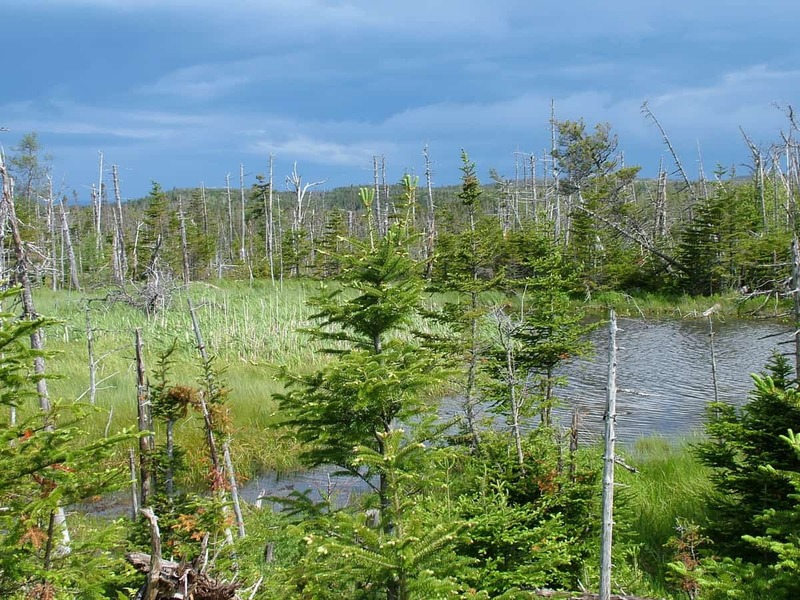 It thrives along stream banks and in acidic soil in bogs and swamps. Its distribution begins in easternmost Newfoundland and extends west into eastern Ontario. 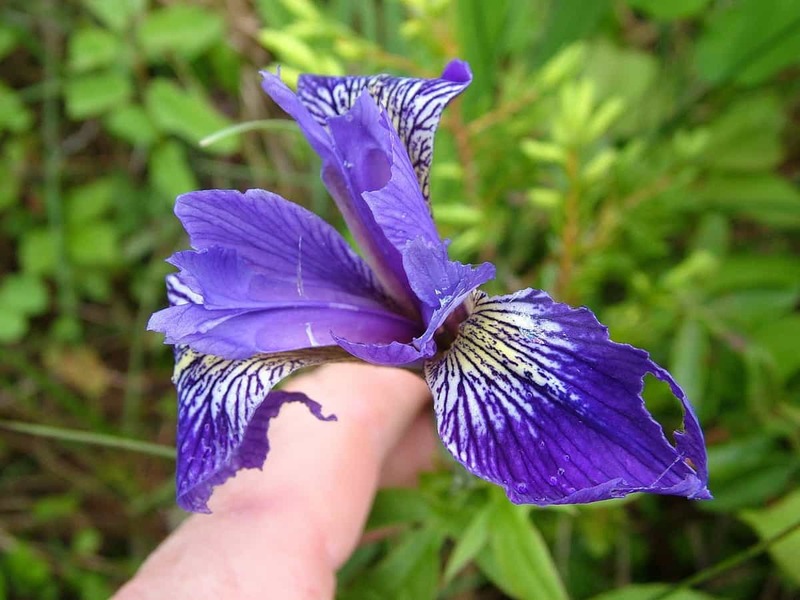 Equally as beautiful was this lone Blue Flag Iris that had seen better days. Again, common in wetlands, this species of flower typically blooms during the summer months. 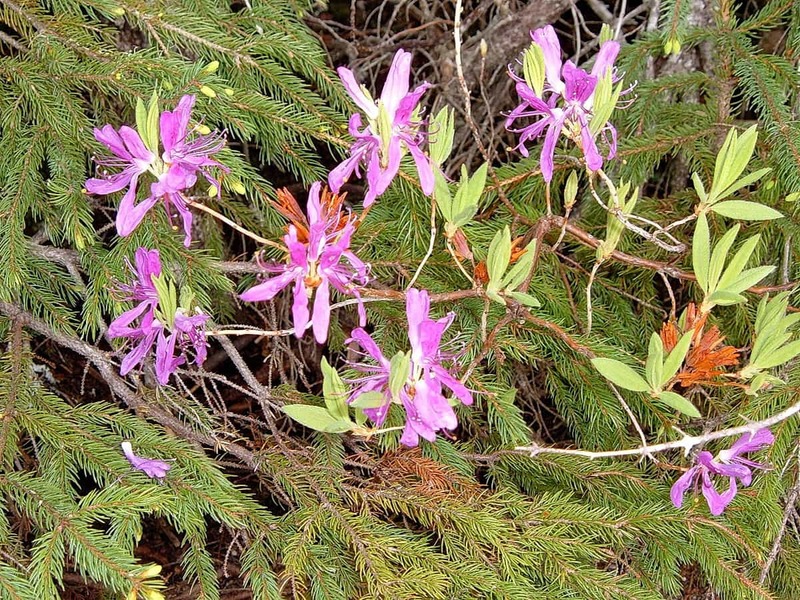 Given that Newfoundland was experiencing a long, cool spring, it was surprising to find one in bloom already. 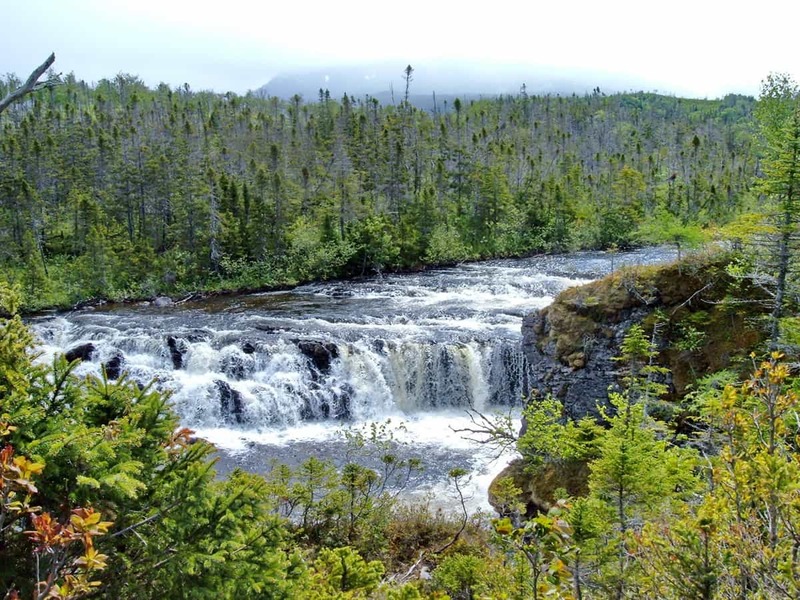 The hike to Baker’s Brook Falls in Gros Morne National Park was predicted to require 2-3 hours. Delaying frequently to snap photos put our time at 3.5 hours. It was well worth the effort!